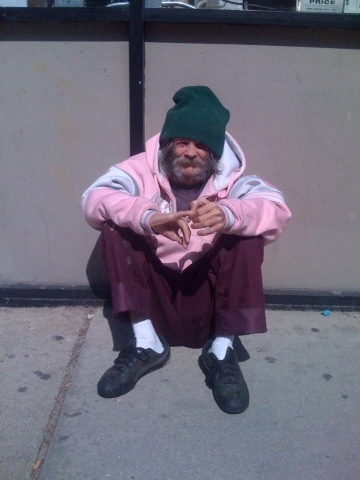 A few years ago, there was this fragile older man who used to sit on the corner right next to my house. Everyone called him Frenchie! I'd known him for years; he had stayed at Cornerstone before, the homeless shelter I'm involved with. He was sweet, humble and shy. Frenchie could easily be described as a "petite" man, and everyone seemed to like him, but he had no money and no one to care for him, so day after day, he sat cross-legged on the sidewalk smoking his cigarettes. Frenchie wouldn't beg for money, he was too shy for that and didn't want to bother anyone! He would just sit there, greeting and smiling at the people who'd walk on by. Random people would stop and give him things he may need, like some spare change, a sandwich or an item of clothing, but in general, he just sat there, day after day after day.